Once you hire staff, you must start paying payroll taxes for each new employee you take on. Payroll taxes include federal income, Social Security and Medicare. Depending on where your business is, this may also include state and city taxes. Before paying taxes, all businesses must acquire a Federal Employer Identification Number (EIN) from the US government. Once a business has an EIN, they can file payroll taxes with the government. 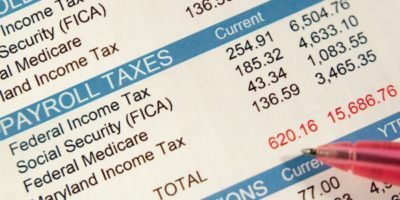 Employers are required to withhold the full amount of federal income tax. Employers are also required to withhold half of the Social Security tax and half of the Medicare tax from each employee’s paycheck, and pay the remaining half of Social Security and Medicare taxes themselves. To figure out federal taxes, employers should have employees fill out a mandatory IRS W-4 form. This form is used to figure out federal taxes, and state and city taxes where applicable. To calculate total federal tax, use the employee’s W-4, Employer’s Tax Guide and Supplemental Employer’s Tax Guide. Social Security tax makes up one half of FICA (Federal Insurance Contributions Act). The tax rate for Social Security during 2018 is 6.2 percent of each employee’s salary, with the employer paying a matching amount. Both the employer and employee are only responsible for a limited amount of Social Security tax. This amount is paid for anything earned up to a wage base of $128,400 for the year 2018. The other half of FICA is Medicare. Employers must withhold 1.45 percent of each employee’s salary for the Medicare tax. In addition, employers must pay a matching amount. In addition to the payroll taxes listed above, employers must pay an unemployment tax for each individual that works at the company. This is called State and Federal Unemployment Taxes (SUTA and FUTA). The tax rate for FUTA is 6.0 percent and it’s applied to the first $7,000 paid in wages to each employee during the year. Employers who pay their SUTA on a timely basis receive an offset credit of up to 5.4 percent. SUTA taxes vary by state. Depending on the state where a business is located, employers and employees may be required to pay state income tax. Taxes vary by state. Though there aren’t many cities or counties with an income tax, a few, like New York City, do have this tax. Check with the local government to see if there is an applicable local tax. The requirement to submit payroll taxes is enforced by a system of strict penalty assessments. Companies receive an automatic penalty from 2 percent to 10 percent for not paying federal payroll taxes properly and in a timely manner, and state and city taxing entities assess similar penalties. A business will also receive additional penalties for not filing monthly and quarterly payroll tax returns, and forgetting to submit a W-2 form for each new employee could cost $50 per form that wasn’t filed in a timely manner. The IRS enforces a much more serious penalty for companies that don’t submit their withholding and social security tax fund payments as required. The IRS will charge a penalty of up to 100 percent of the unpaid amount to any company or individual, such as a corporate executive in charge of making sure the payments take place. Need information about payroll taxes? The employer must withhold payroll taxes from an employee’s paycheck to comply with government regulations. The employer first determines the total amount of salary that the employee earned during the time period covered by the paycheck. This salary can contain hourly wages, overtime pay, bonuses, profit sharing, gifts to an employee and all other types of compensation that were paid to an employee during the pay period. From this total pay which is known as gross pay, the employer is required by law to withhold certain percentages of an employee’s paycheck to pay required tax withholdings. After voluntary payroll deductions are subtracted and legally required payroll deductions are subtracted, the pay that the employee receives is called their net pay. The employer must report withholdings to government agencies. The employer must also pay both his or her share of the payroll tax withholdings and deposit the employee’s withheld taxes to the requisite government agencies using the appropriate forms. Additionally, the employer is responsible for “preparing various reconciliation reports, accounting for the payroll expense through their financial reporting, and filing payroll tax returns.” See the linked article for a list of the reporting requirements and the appropriate forms. Federal, state and local income taxes are subtracted from the employee’s gross pay by the employer. The amount to subtract is determined by using the number of deductions declared by the employee on the W-4 form in conjunction with the tax charts provided by the Internal Revenue Service (IRS). Social Security: both the employer and the employee pay 6.20 percent of the employee’s gross pay as of 2016 on earnings up to the applicable taxable maximum amount, $118,500 in 2016. This includes no increase over 2015 as there was no increase in the Consumer Price Index (CPI-W) from the third quarter of 2014 to the third quarter of 2015. Note that individuals who are self-employed are responsible for paying the full amount. Because the US tax laws are so confusing, you might also want to talk with your state Department of Labor and/or a qualified CPA when you venture down the road of hiring employees. We a business accounting firm who proven experts in matters relating to payroll taxes and deductions.